Mülheim, November 7, 2018 – Turck is expanding its extensive IO-Link portfolio with new Class A and Class B I/O hubs with protection to IP67 and HF RFID read/write heads with threaded barrels designs. Thanks to SIDI, the Simple IO-Link Device Integration, the new IO-Link devices can be configured directly from the Profinet engineering system without the need for additional tools. The slimline 32 mm Class A I/O hubs of the TBIL-S series enable eight digital signals to be connected to an IO-Link master. The hubs thus reduce the wiring required for the final meters in machines and plants. Besides the TBIL-S3 with eight M8 sockets, Turck offers the TBIL-S4 variant in the same ultracompact design with eight universal I/Os on four M12 ports. The I/O hubs of the TBIL-M series offer eight M12 sockets for sensors and actuators. They comply with the Class B IO-Link specification, which offers additional passive safety: Users can safely disconnect actuators connected to Class B devices by disconnecting the power supply. Communication with the I/O hub as well as the function of the other sensors are retained, thus allowing the creation of cost-effective safety applications. All I/O hubs can operate in the extended temperature range from -40 to +70 °C. The cylindrical TN-M18 and TN-M30 HF RFID readers also come with an IO-Link interface on board. The read/write heads with protection to IP67 are provided with a metal housing with an M18 or M30 male thread as well as an M12 connector. The RFID readers are optimally designed for use in the production controllers of assembly lines and can be assigned parameters easily thanks to IO-Link. 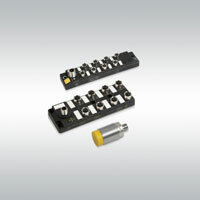 When combined with Turck's TBEN-L IO-Link master, the SIO function of the read/write heads can be used in tasks, such as for reading tags or comparing defined data ranges as a switching signal.